New models have replaced the 2157’s, notably the CL1314 and CL2300 devices. 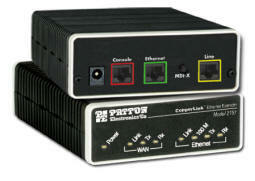 The Patton 2157 was an extremely popular long distance Ethernet extender capable of 5.7 Mbps speeds and working to distances approaching 6 miles. Made in the USA — Patton’s American-made manufacturing process delivers high-quality networking solutions with reliability you can trust. Whether it’s connecting corporate LANs or remote offices, the 2157 is the simple solution for ensuring the best combination of speed and distance in the industry. Many LAN extenders are set for a single rate, or require difficult configurations in order to connect LANs at different distances. With its auto-rate adaptation feature, the Model 2157 ensures that users get the highest speed possible for the distances they are trying to reach. To make it even simpler to use, the Model 2157 comes with a built in MDI-X switch to allow easy connection to LANs or PCs with no need for worrying about whether you have a cross-over cable or not. Setup is as consists of connecting the Ethernet port, connecting the copper twisted pair, and powering up the units! Patton’s Model 2157 is the perfect fit for cost-effective, simple, and efficient LAN extension! Line Interface: Transformer coupled, 1500 VAC isolation. Weight: 2.0 lbs (1.0 kg).